Ok, so I lied. 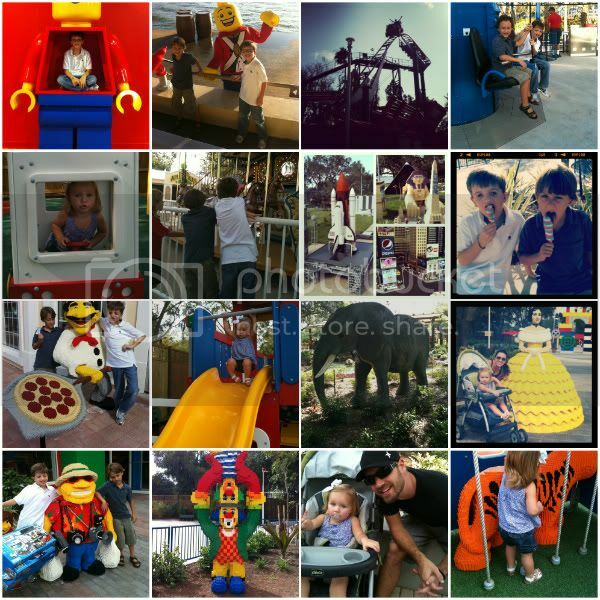 I thought the next post would be Christmas but while going through all my pics I came across our pics from Legoland. My cousin Heather is a school teacher and her school was going on a field trip there. As are all the schools in Florida this year! But since we homeschool we weren't going to get the awesome price of 5.00 per child to get in! So when she called and invited us to go with her school we jumped at the chance. I have to be honest, I didn't have much of an expectation of Legoland. Being that we live in Orlando and have Disney World, Universal Studios, Seaworld and lots more theme parks right in our back yard. But was still looking forward to taking Andon who is a major Lego fan. And I have to say that I was totally surprised. There was so much to do there!! So many rides that we didn't get to ride them all. Fun rides for the kids as well as the adults. Even Adelyn was able to ride a couple. They had great little areas for her to play and not feel overwhelmed by big kids and of course TONS for the big guys to do. There were amazing sculptures made out of Legos. Full cities!! I think that was my favorite part. Walking through Las Vegas, New York City, Miami and lots more all made of LEGOS. So neat! Must have taken forever to build. There was even a full size SUV built out of Legos. Andon brought along his best buddy Jordan who is also homeschooled. These two seriously crack me up. They were pretending to be brothers all day. They really are the best of friends who get along so well and have a lot of fun together.